When you visit Watson’s mill in Manotick, head up to the second floor and stand quietly. Do you feel that cold draft on your neck, can you hear, echoing through time, the screams of a young woman? On a misty day, some say they can see the ghost of Anne Crosby looking out from a second storey window of the old Watson's Mill. They contracted Mr. T. Landgrell of Ottawa to construct a stone mill and the grand edifice was opened in February 1860. The mill was outfitted with five of the latest “Tyler’s Patent” outward pressure central-discharging water wheels (turbines), marvels of modern technology. The grinding stones were the finest quality in the world, imported from France. The mill was capable of producing 100 barrels of flour a day and the sawmill could cut up to two million board feet per year. Joseph Currier, born in Vermont in 1820, had seen tragedy in his life. Although his first marriage had been a happy one, his three children had died in 1855 and his wife, Christina Wilson, passed away in 1858. The building of the mill in Manotick was a welcome distraction, it took Joseph’s mind off the past and he began looking to a bright future. That future soon included the enchanting, tall and beautiful Anne (Annie) Elizabeth Crosby. In August 1860, Joseph first met Annie while staying at the Crosbyside Hotel in Lake George, New York, operated by Annie’s parents. It was apparently love at first sight, the two were soon dating, then engaged, and on January 25, 1861, they were married. After spending a month-long honeymoon travelling in the northern U.S., Currier returned with his bride to Manotick. It was the one year anniversary of the mill and Joseph brought Annie, dressed in a beautiful white hooped dress, to visit the mill. The full crinoline hooped skirt, while fashionable, was also dangerous, since the wearer wasn’t always aware of where the edges of the dress were. Annie was blissfully unaware of this deficiency. Joseph and Annie entered the mill, Annie gazing in awe at the numerous belts and pulleys, powered by the five turbines in the basement of the mill and operating machinery on the three floors of the mill. She could feel the entire building vibrating to the tune of the machinery. They made their way up to the second floor, standing near one of the fast rotating shafts. With a smile, Annie turned to Joseph, perhaps to ask a question or utter an endearment. As she turned, her dress flared out, catching on the rotating shaft. In an instant she was gone, flung against a support post, killed instantly. Workers rushed to the scene but there was nothing that could be done. They escorted a shattered Joseph out of the mill. He never looked back. He left Manotick, never to return. He moved to Ottawa and severed his interests in the Manotick mill in 1863. It took Joseph many years to recover, but eventually, in 1868, he re-married, to Hannah Wright (the daughter of Ruggles Wright who was the son of Philemon Wright, the founder of Hull). That year, he built a grand new house in Ottawa for Hannah. You can still see this house today, the address is 24 Sussex Drive. Anne has never left the mill. On misty evenings, the apparition of a beautiful, tall, flaxen-haired young woman can sometimes be seen looking out from the second floor windows. Carroll, Catherine L., King of the Rideau, Rideau Valley Conservation Authority, 1974. Mika, Nick and Helma with Larry Turner, Historic Mills of Ontario, Mika Publishing, Belleville, 1987. 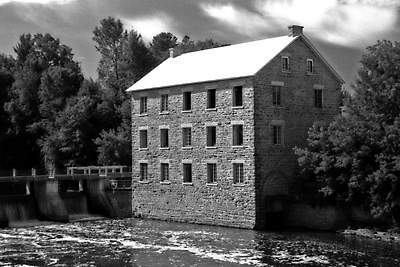 Ricketts, Bruce, Joseph Currier and The Ghost of Watson’s Mill, article on www.mysteriesofcanada.com. Wikepedia entry for Joseph Merrill Currier. 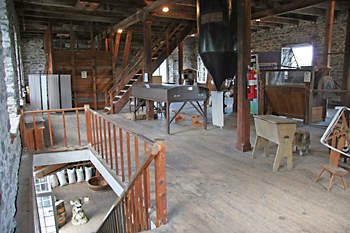 Watson's Mill is open to the public with many interpretive displays. Today the exhibits on the second floor bear no hint of the tragedy that occured here in 1861.